Give me a wisp of smoke in a dish, and you've just served me bliss. A subtle smolder weaves good memories through each bite, making them infinitely, sentimentally better: our wood stove in Connecticut, roadside redneck barbeque joints down south (the best kind), sleepaway camp, springtime shad bakes on the banks of the Potomac. A happy montage plays through my head each time I take a delicious, haunting taste. We smoke our share of meats in the summertime, a primal rite that has evolved into epic feasts. These, too, wind through that halcyon, mind's-eye filmstrip. Our trusty smoker, borrowed taken from my brother-in-law, works overtime on country weekends, most often transforming pork shoulder and spices into a tender, shredded treat (more on that in a few months). Right now, it's not so easy standing around a giant metal canister for hours on the New England tundra. No amount of whiskey can make that fun. And, our kitchen just doesn’t have the ventilation for indoor smoking. So this winter, I’ve contended myself with other ways of adding smokiness to food and stoking the–ahem–glowing fires of memory. I guess you could make anything smoky with a sprinkling of smoked sea salt or liquid smoke–but to me, there's something empty in that (and in the latter case, fake). A couple of posts ago, I cooked black beans with dried chipotle peppers; I like this delicate infusion for some vegetarian dishes. You can buy various smoked peppers in powdered form, too, the most familiar of them being smoked paprika. Speaking of which, I love this recipe for smoky fried chickpeas from Food 52. But let's just cut to the chase–unless we keep kosher, or are vegetarian (hell, maybe even in spite of it), it's bacon we crave. Bacon, and related smoked pork products, are the most intense, most bang-for-your-buck way to add a little fire–and voluptuousness–to food. A bit chopped up, rendered, and crisped (I pour off excess grease and save it under the sink in a jar, simply because my mother and grandmothers did the same) goes a long way toward elevating pastas and savory tarts to the next level. The bacon we get, from an excellent farm upstate called The Piggery, is generously peppered and heartily smoked–just the way I like it. Plus the pigs lead healthy, free-roaming idylls, and I'm positive that comes through in the flavor. This brings me back to our summer smoke-a-thons, and to a traditional winter recipe that captures their essence in the most literal way: smoky split pea soup. 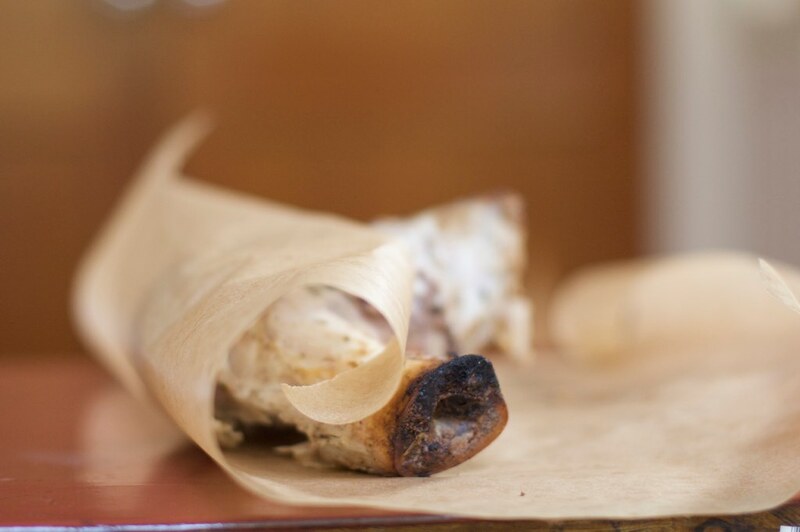 We always save the meaty, smoked bones and use them later in the winter. I'm a big advocate for not wasting a thing, and as a result my freezer makes a great Halloween sideshow. This past Labor Day, we smoked our last pork shoulder of the season, trying to ignore the chill that was elbowing out summer. We enjoyed it with all the sides, and once we had finished every last shred, I wrapped up that bone and nestled it in the freezer among parm rinds and stocks. I took it out when I was in the mood for the soup, simmered away, and enjoyed. Slowly, if only for a moment, I caught a whisper of warmer days. Vegetarian friends: are you still here? 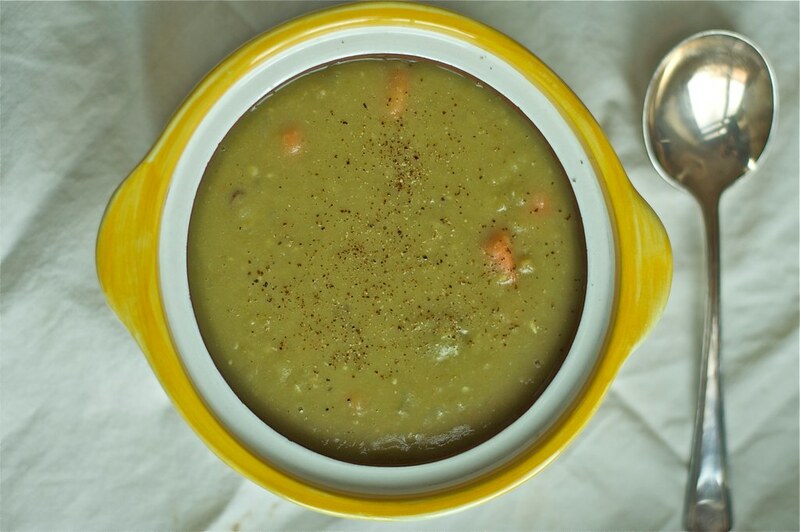 check out this clever recipe for a meat-free smoky split pea soup, from 101 cookbooks. Heat a sturdy pot or dutch oven over medium heat and add oil. Stir in onions and bone (or slab bacon) and cook for 5 minutes or so, until fragrant. Add garlic and bay leaves, and cook for a couple more minutes, stirring occasionally. 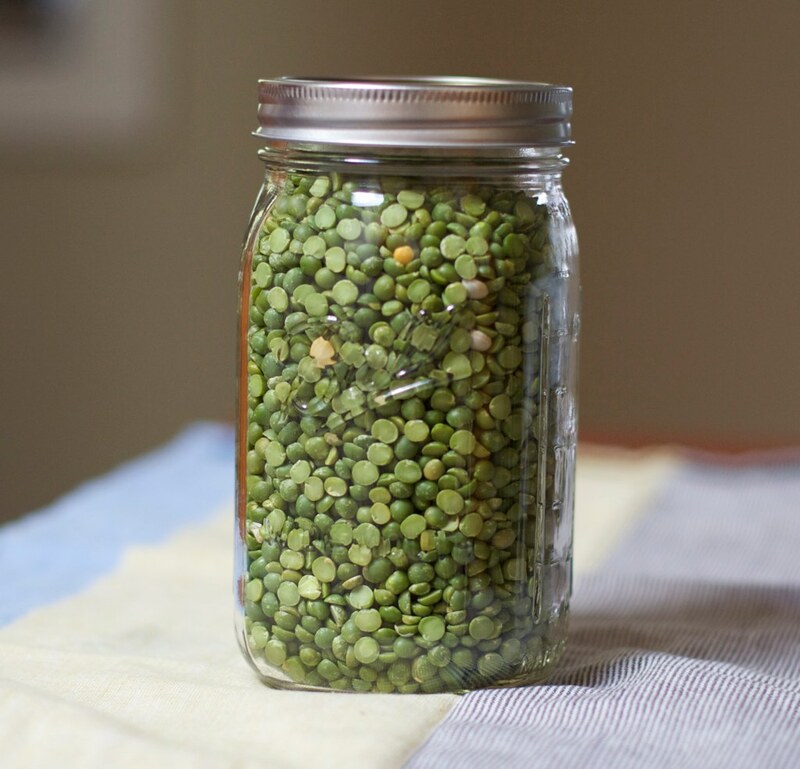 Pour in peas and then cover with water until peas are covered by an inch or two. Give a stir, then raise heat until soup comes to a boil. Lower heat and simmer for the next hour, checking and stirring with a wooden spoon occasionally, scraping the bottom so peas don't stick. You'll probably need to add a bit more water as peas drink it up. After about an hour, add carrots and celery (I put them in a bit later so they don't get mushy) and simmer soup for another 30 minutes or so, until the peas have fallen apart and become smooth. Give a few vigorous stirs and decide if you need to add a little more water. Once the desired consistency has been reached, add seasoning: splash in a couple of spoonfuls of vinegar to taste, salt, and add a few cranks of pepper. I like a lot of coarsely ground pepper in this soup. Remove bay leaves and bone/bacon before serving. that smoker even has the bears coming around for a whiff ! that smoke meat is great,when we where a kids we used to smoke fish also,great taste.